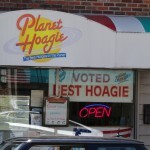 Philadelphians love their hoagies, and Visit Philadelphia, the tourist office that targets leisure travelers, devotes a prominent slice of its website to the sandwich at VisitPhilly.com. The site offers a directory to dozens of hoagie establishments in the city and beyond. 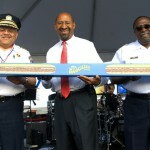 A direct link to the Hoagie Finder is in the Links section below. Residents of Greater Philadelphia don't need a survey to tell them a hoagie is a hoagie—not a submarine sandwich, or hero, or grinder. 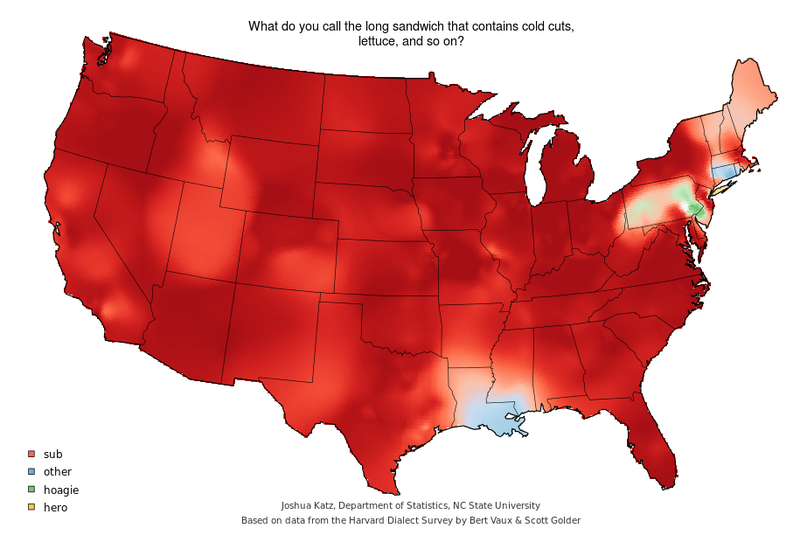 But any doubters can help themselves to a serving of the Harvard Dialect Survey, which offers solid evidence that around Philadelphia, "hoagie" is king. The survey by Bert Vaux and Scott Golder, which concluded in 2003, posed 122 words, phrases, or usage choices to nearly 31,000 participants across all 50 states and the District of Columbia. Question 64 on that survey was: What do you call the long sandwich that contains cold cuts, lettuce, and so on? The results, reflected in this map, show the United States as a sea of submarine red, with only a swath of eastern Pennsylvania and southern New Jersey solidly in the hoagie league. 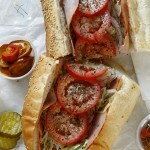 A hoagie is a sandwich made on a long Italian roll containing a variety of Italian meats and cheeses, lettuce, tomato, and onion, and dressed with olive oil, vinegar, and spices. 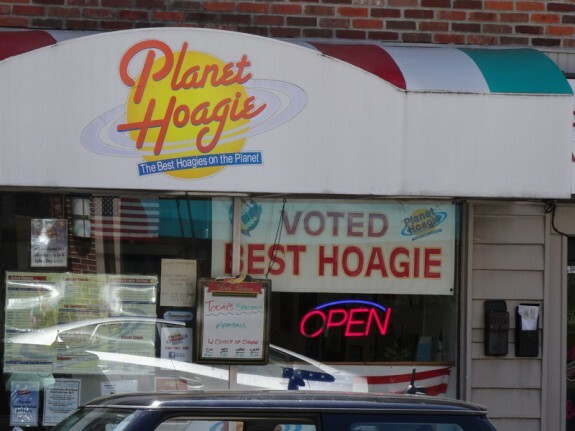 Its exact origins are uncertain, but by the end of the twentieth century a mayoral proclamation declared the hoagie to be the “official sandwich” of Philadelphia. 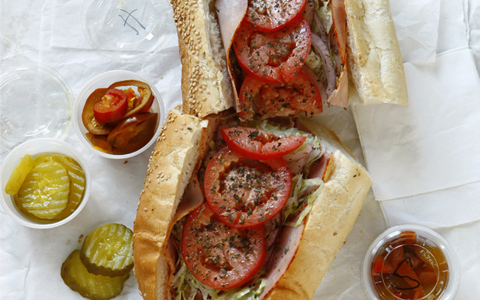 Known outside of the Philadelphia region as a submarine sandwich, a grinder, or a hero, according to the Oxford English Dictionary the word hoagie did not come into common usage until 1967. However, within the region people were using the term as early as the 1930s, and it appeared in the Philadelphia City Directory for the first time in 1945. In 1950, a letter to the New York Times from a tourist to Philadelphia from Baltimore noted that the sandwich he recognized as a grinder was being referred to as a hoagie, hoggy, horgy, or hogy. Whatever the source for the name, the sandwich is a connection to the region’s Italian immigrant heritage. When large numbers of Italians immigrated to the Northeast in the early twentieth century, many were motivated to do so by the hunger and poverty of their lives in Italy. In the United States, although they were still poor, they had access to better quality food and more meat than ever before. As one Italian immigrant wrote in a letter to his brother, still in Italy, in America “il pane e’molle, ma la vita e’dura” (“the bread is soft, but life is hard”). The hoagie’s excess, with its layers of meat and cheese and its sheer size, is a result of this newfound culinary abundance. By the late twentieth and early twenty-first century, the hoagie had become representative of the Philadelphia region, eaten by all ethnicities and races. In 1992, Mayor Ed Rendell named the hoagie the Official Sandwich of Philadelphia. The convenience store chain Wawa has embraced the sandwich, and for years has sponsored a summer marketing campaign it calls hoagiefest. 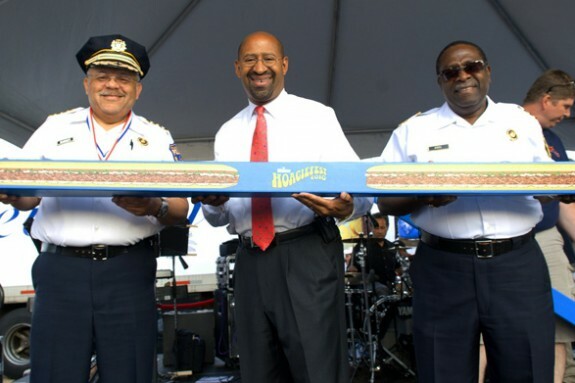 In 2014, the observance included an exhibit on the history of the hoagie at the National Constitution Center. Regional chain stores like Wawa and mom and pop delis and sandwich shops have helped ensure that the name remains dominant in the region. Mary Rizzo is co-editor of The Public Historian and Public Historian in Residence at the Mid-Atlantic Regional Center for the Humanities at Rutgers University-Camden. Smith, Andrew, and Bruce Kraig. The Oxford Encyclopedia of Food and Drink in America. Oxford University Press, 2013. Hines, Mary Anne, Gordon M. Marshall, and William Woys Weaver. The Larder Invaded: Reflections on Three Centuries of Philadelphia Food and Drink: A Joint Exhibition Held 17 November 1986 to 25 April 1987. The Historical Society of Pennsylvania, 1987. Eames, Edwin, and Howard Robboy, “The Submarine Sandwich: Lexical Variations in a Cultural Context,” American Speech, 42 (4) 1967. Diner, Hasia R. Hungering for America: Italian, Irish, and Jewish Foodways in the Age of Migration. Cambridge: Harvard University Press, 2009. Paesano’s, locations at 1017 S. Ninth Street in South Philadelphia and 152 W. Girard Avenue in Northern Liberties, Philadelphia. Sarcone’s Deli, 734 S. Ninth Street, South Philadelphia. Carmen’s Deli, 42 E. Browning Road, Bellmawr, N.J.
Abbruzzi and Giuntas Italian Market, 3211 Route 38, Mount Laurel, N.J.
Carlino’s Market, 2616 E. County Line Road, Ardmore, Pa., and 128 W. Market Street, West Chester, Pa.
Salumeria, Reading Terminal Market, Twelfth and Arch Streets, Philadelphia. Italian Market, centered at South Ninth Street and Washington Avenue, Philadelphia.